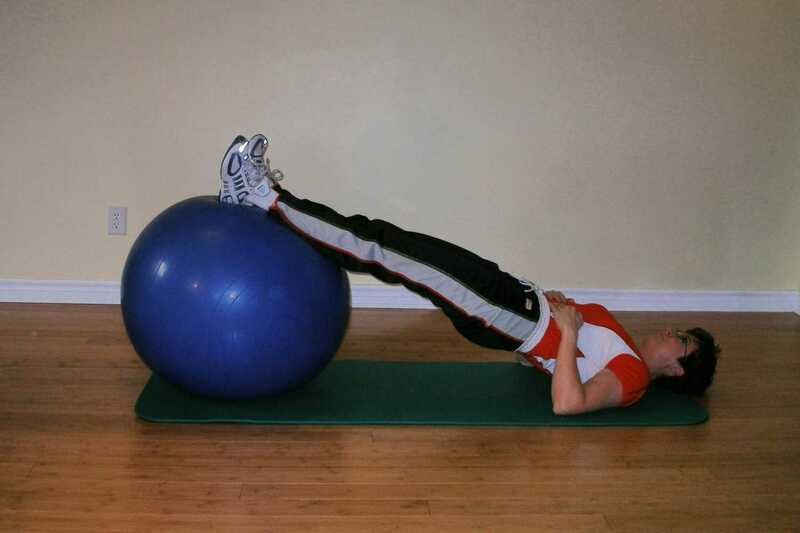 This dynamic ball exercise requires you to start in the supine bridging position, on your back with heels resting on the ball. Arms are over your chest. You can keep your elbows off the floor to add a level difficulty. Engage your abdominal muscles through abdominal hollowing. This ball exercise is more difficult than the hamstring curl with arms out to the sides because your base of support is a little smaller. You can make your base of support increasingly smaller by raising your arms straight up toward the ceiling, or by adding more air to your ball, or both. Be sure you can master the static bridging exercises before attempting anything dynamic. You need to be able to control your spinal position without any limb movement before you should add any limb movement. Remember, these exercises have more to do with control than brute strength. The more control you have over the positioning of your spinal joints during an exercise the less likely you are of putting those joints into a position where they will be injured.